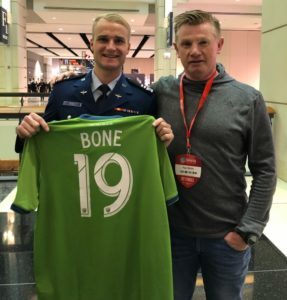 The Seattle Sounders selected United States Air Force Academy midfielder Tucker Bone on Friday with the 20th pick in the first round of MLS SuperDraft 2019. Bone, 22, was born in Tacoma, Wash., and grew up in Granite Bay, Calif. He finished the 2018 season with 13 goals and six assists in 22 appearances and was a semifinalist for the MAC Hermann Trophy, which is awarded to college soccer’s best player.